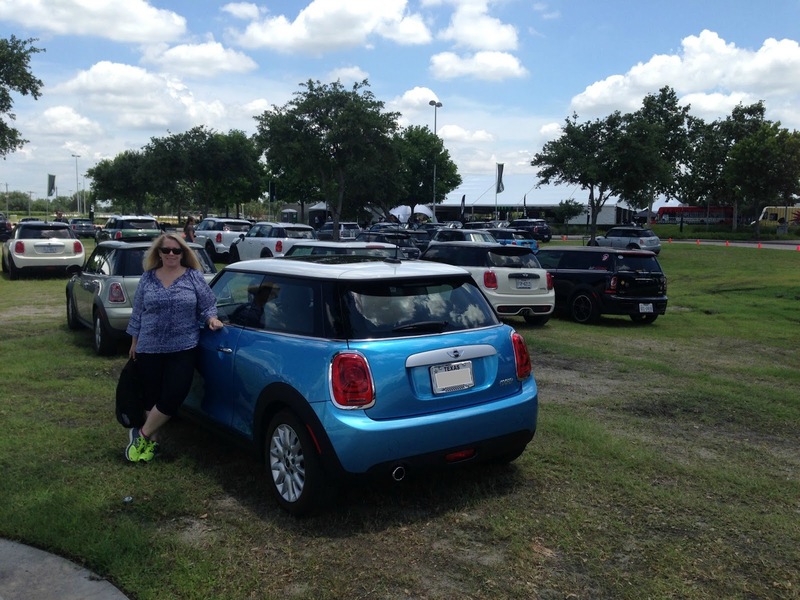 My Journey to Fit: MINI Motoring Challenge! The Duchess and I - ready for an adventure! In the car - they were pointing me to the silver Mini, but then a red one pulled up and I asked to drive it. Turns out it was a John Cooper Works model, which is a super souped-up performance car. Nice way to start! You get in the car, get situated with the seat position, drive up to the start line and get instructions - and then, it was go time! Really fun but over too fast. They don't speak to you, and if you look at the picture, you'll see that their identities are hidden. The bottom right is when my Bumby was appraising me. 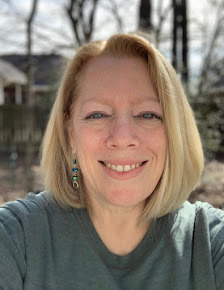 Click the picture to read what she wrote - I appreciated the "hippie mama vibe" description. They give you a rating, and I scored a 9.5 while Jeff only scored a 9.0, hah! The next course we went on was the Pinball one. We had a 4-door black Mini this time, and they had a video camera mounted on the inside of the windshield, so we have a recording of this ride - here's the link, if you want to watch. Jeff was making pinball machine noises throughout, but you can't hear him too much because the windows were down and there was a lot of wind noise. Looks just like my car! I made him pose for a picture, but we were both dying to dig in to that sandwich! There were ice-cold bottles of water available everywhere you turned throughout the event, which was much appreciated. 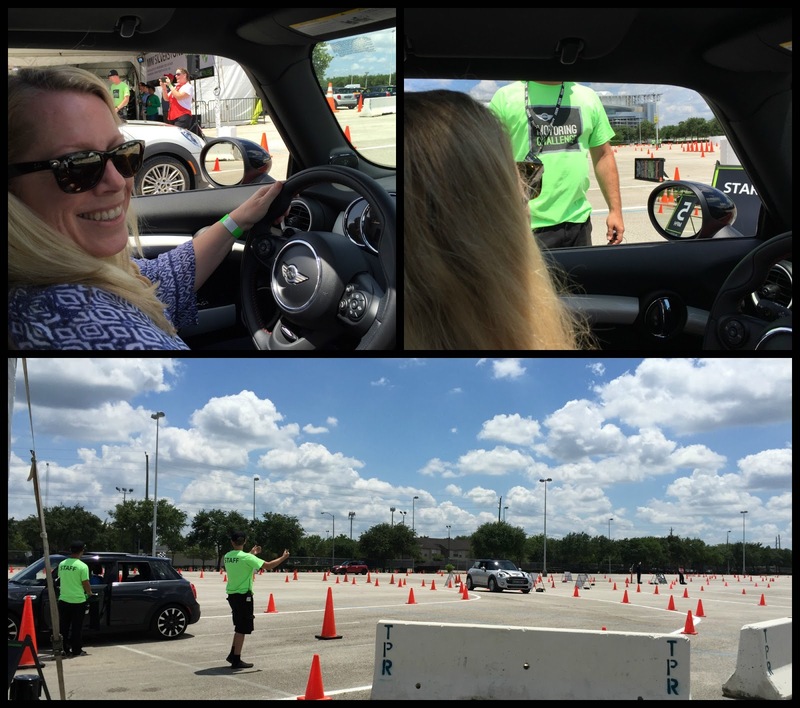 MINI did their best to combat Texas heat, I'll say that! I'm not saying you were supposed to drive it like you stole it, but hey - they said don't get caught, so that translated as "go really fast" to me! Waiting for my car, and to get my card punched. This one was the most challenging, and either I was more relaxed, or else I just wasn't paying enough attention, but all of a sudden I hit a U-Turn on the course at about 40 MPH and let's just say that I really got a feel for how quickly a Mini could slow down and make a sharp turn. I'm proud to report that I didn't take out any cones on this course (or the others, for that matter) - you didn't want to be the one to do that, because if that happened they didn't let any cars onto the course while a minivan (haha, of course) drove around and put the cones back in place. The last thing we did was test out the parking assistant feature - this is the deal where the car parallel parks for you. They didn't let us drive this one; rather, we were passengers while a MINI employee demonstrated how it worked - which was pretty fascinating, I have to say. Plus the A/C was on full blast, so it was nice to cool down for a few minutes, too. Doing something like this was definitely outside of my comfort zone, but I had a great time, met a lot of friendly people (MINI owners are quick to whip out their phones and show you pictures of their cars! ), and hey - I got to channel my inner Ricky Bobby and pretend I was a race car driver for an afternoon! 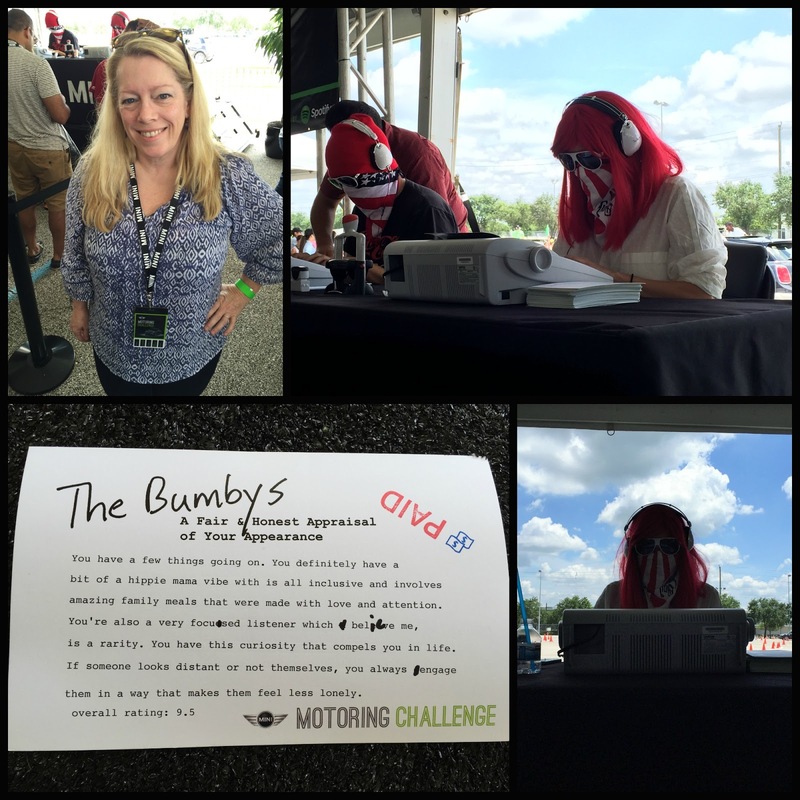 That's so fun Shelley, and as I was reading this post I was thinking about Ricky Bobby! That sounds so neat! My husband just flew out to Houston this morning. We just checked the weather and saw 80 percent humidity! LOL on the invisible fire! I will have to watch that movie again - so many fun lines kept popping up as I wrote this recap. Well, now I want to watch Ricky Bobby :) What fun you had. I wonder if the Bumbies are something that is famous in Britain? Oh, okay, now I clicked on the link and I see the description. And driving the Dutchess in Houston?? You are a very brave woman!! I like days like this. You guys did something sheerly for fun and made a great memory. Worth the drive in the hellacious Houston traffic I'd say! I was thinking the same thing - there was no agenda, no specific time we had to be there, and except for gas, we spend no money! Usually if we're traveling like this it's for a race, and we all know the stress and money that goes into that, LOL! How fun! Jimmy & I have a friend with an original Mini that he used to race. He has it on display at his mechanic's shop in Navasota. One man we kept running into has a '79 Mini (among others) - it was parked right out in front, next to the biggest Mini (a Clubman). It was so cute...looked like a little Matchbox car! That sounds like a blast of a weekend! OK, this is the 3rd time I'm typing a comment due to sign in problems, so I'll spare you the Mini-Angst this round (JEALOUS) and just say that the event sounds like it was awesome and glad you had fun! What a fun event! Glad you made the choice to go since you had so much fun. I watched the video on FB and I loved hearing your voice and especially your laugh. I'm just shaking my head in bemusement that there even IS an event like that. What a fun (and different) thing to do!